And he's ready to add some Christmas cheer to your new jewelry creations! 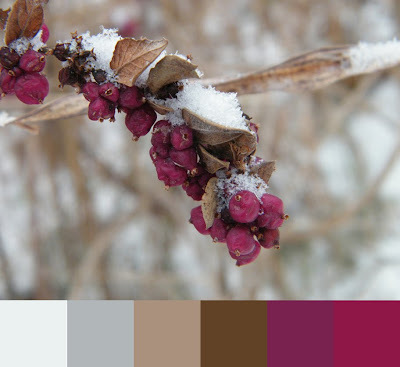 And if you're looking for inspiration for your next creations, check out my latest post at Art Jewelry Elements—I've created some wintery color palettes and paired them up with beads from our member's shops. Over at Art Jewelry Elements blog we have a holiday party going on!! Fun blog posts and a big sale in all our member's shops… what better time to stock up your favorite artisan beads, or get a new piece of handmade jewelry! All my beads and jewelry are 15% off with our group coupon! Go here to get the coupon code and to see all the other shops participating is this fantastic sale!! So just how many critters are in this mound??? And the winner is Despina! Yay! Please contact me at rspayne.art@gmail.com with your favorite critter and your mailing address. Thank you all for playing along! This was so much fun—I'll have to do it again on the next Painting Day (and with MORE winners)! Stay tuned for the next guessing game! How many sleepy critters do you think are in this mound? I'll announce the winner(s) on Thursday. Happy guessing!